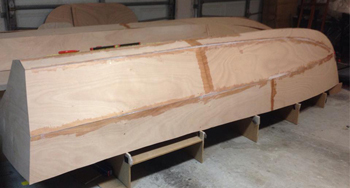 Within a couple of weeks from the start of assembly, this clients Spirited 480 now has it's main hull structure built. Most of the work is done by one person and heavy lifting has been done with occasional help. An advantage has been that all parts are relatively manageable for man handling. For more information please view our Kits and Designs pages. 4.2m Ripple - All Aboard! spacious for this size boat. The twin hulls offer good stability and support when loaded. This design has shown that it will accomodate the targa and hardtop efficiently. Versatile kit packages offer a range of different materials to suit different preferences and budgets. Gaboon plywood kit packages have been popular for it's economical cost. Keeping the build cost low. DuFlex kit options have been popular for those preferring a more ​high-tech build material. ​See our Ripple Tender page for more information. 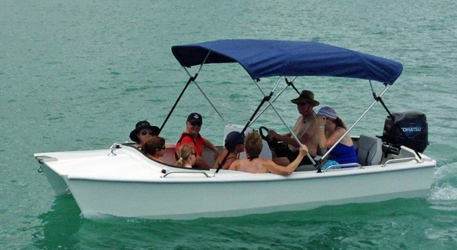 4.2m Ripple Tender - Great Family Project! 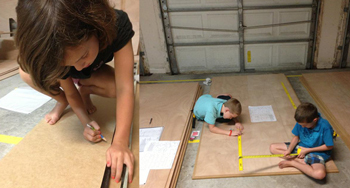 The Wilson family have all jumped in with great enthusiasm to build their very own 4.2m Ripple Tender. Being overseas the Wilson's opted to buy the plans only and source their material locally. They are building from Gaboon plywood and doing a very nice job of it. It is so nice to see the kids getting involved and from what we hear they are the main driving force. What a great family bonding experience to all be involved in a project such as this. 4.2m Ripple Performance a great success! "The 4.2m Ripple got up to 38KPH (24knots) and was very Smooth, took her out in a bit of rough stuff and she handled like a dream, was very impressed with her performance, my centre console design works well, even with 3 people she planed easy. On Xmas day I put 9 people on board to go to shore and she handled it like a dream could have fitted more as it did not seem crowded and she held the weight well buoyancy-wise. Does not seem to use much fuel either which is a blessing. Overall very happy and even my wife loves it." 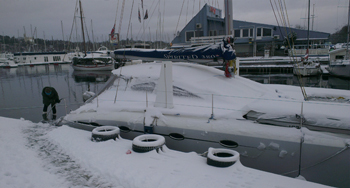 We were sent these photos from a Spirited 380 owner in Norway. 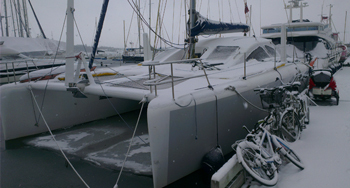 A Spirited 380 covered in snow is indeed a rare sight and more commonly associated with white beaches and palm trees in tropical climates. The owner lives aboard this boat in Oslo and does most of his sailing in the summer period for obvious reasons. Although... what a great way to spend Christmas! The Spirited 480 project in Port Stephens is now taking shape. The owner has recently fitted the forebeam in readiness for the installation of the hull panels. You may have seen earlier that this boat was special ordered with 100kg foam hulls. This client has already assembled all his furniture modules which have been finished with high detail including doors hinged and catches fitted, fairing done and insides all painted. Even things like the fridge which is in-built have been done and all mounts for his water-maker etc have all be prepared. The main parts are ready for fitting so the assembly should be rapid from here. We will keep you informed in the coming weeks with more updates on this project. We are happy to launch our new site with detail on all our designs and services. 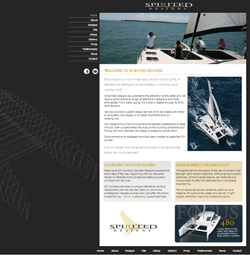 Our designs page has been grouped into four categories to provide you with easy reference to your required design/kit choices: Sail, Power, Power-Sail, Tenders and Custom. Our kits page is now taylored for each design for a more detailed overview on what is included. Following expressed interest in an online purchasing facility for our smaller designs, we have now made available the Spirited eShop. You can now order your plans and/or kits for the Ripple range of tenders. From our smaller designs, Seascape and Stow-Away range, the construction plans are available from our eshop also. Alternatively you can still continue to contact our office and make your purchases directly. We hope you enjoy the new site and look forward to hearing for you. Happy Boating and Building in 2014!